Entries for training races will be taken starting Fridays at 8:00 a.m. and closing at 12:00 p.m. or when the total number of entries reaches 55 - first come, first serve. Overnights will be available shortly after entries have closed. Entries will be limited to 55 Quarter Horses, two-year-olds preferred. Entries for maiden three-year-olds and upward will be taken in the event there are not enough two-year-old entries. No Thoroughbreds! Each trainer is allowed to enter four (4) horses and a few alternates in the event the races do not fill with single entries. Horses that have run in a training race one week are least preferred to run the following week. Post Time for first race each training race day is approximately 11:30 a.m.
A copy of the foal certificate is required to be on file in the Racing Office as papers will be used in paddock identification. This is the trainer's responsibility prior to entries, and your horse will NOT run without papers on file. All personnel are required to have a current Texas Racing Commission license. No one will be allowed on the grounds without one. NOTE: You will not be able to obtain a license on the day of training races as the Racing Commission office is closed on Mondays. Trainers are not allowed to bring additional horses to work in the morning prior to training races as there is no additional room in the receiving barn. NO horses in training races will be in the barn area except in the receiving barn. All horses entering the grounds must have an ORIGINAL health certificate and CURRENT Coggins upon their arrival or they will not be permitted on the grounds. Obtaining a header, rider and pony person and their fees are the responsibility of the trainer. Head your own in the starting gate - only licensed trainers, assistant trainers, or assistant starters are allowed to head horses in the starting gate, and safety helmets are required.. This schedule is subject to change. 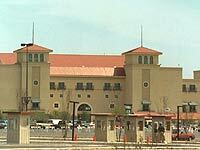 Retama Park reserves the right to cancel or reschedule due to lack of interest. For more information, visit the track’s website at www.retamapark.com.